Take an additional 40% off of already marked down items. Wednesday the 20th thru Sunday the 24th)- still a few days left! There is a limit of 3 pair per customer. They have also recently reduced prices on more items, so there should be some good clearances. Their online shipping is pretty cheap, so I always shop online instead of dragging my kids to the store with me! PROMOTIONS~Spend a minimum of $25* and qualify for these great savings. *excludes alcohol, tobacco and pharmacy. * * Save $5 instantly at checkout when you spend $20 on two or more participating Nestly products in a single transcation. Limit 3 rewards per transaction. For those of us who aren't picky which brand of diapers our babies tinkle in, Walgreens brand diapers are on sale this week! Buy 1 @ $7.99, get one 50% off! = 2 / $11.98. 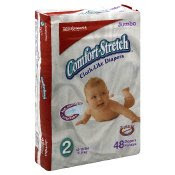 = $2.98 for 2 packs of diapers. That's a smokin' deal @ $1.49 EACH. This deal at Walgreens is still going on, so check it out! , they're having a Kellogg brand sale; if you buy 4 for $10.00, you get a $5.00 RR (register reward, coupon that prints out near the register after you buy your stuff, also referred to as a Catalina). Last Sunday's newspaper (8/3) came the Kellogg TASTE insert - which had coupons for Kellogg's stuff in it. I also got another Red Plum insert Wednesday with my ads for this week, which also had another TASTE insert in it! HORRAY! - - -Get a $5.00 RR for your next purchase! **If you use coupons with your first purchase, you won't get the RR! If you buy 12 boxes of cereal for $30.00, you'll get $15.00 in RR back, (**If you use coupons with your purchase, you won't get the RR's!) and THEN you can mail for the $10.00 MIR (mail in rebate) that is also in the TASTE insert (must buy 10 participating boxes of cereal in one transaction to do the MIR). That way you'll get 12 boxes of cereal for $5.00! That's $0.41 cents each! If you're in need of yummy cereal, that's a pretty good deal! On 8/8/08 Restaurant.com is doing a special one day offer of 80% off gift cards! Use the code FIRST. Remember to read the fine print- there is almost always a minimum amount you have to spend to use the gift card and beverages are often separate. Click here for a $1.50 off any flovor Yoplait Kids cup yogurt or yogurt drink coupon! I was able to print it twice. Deanna's wanted me to post this here for a while, so here goes. I get a TON of stuff for nearly free by getting coupons from eBay. When the ads come out tomorrow, see what's on sale & then look up the coupons on eBay. You can usually get them in lots of 10-20 for about a dollar. They usually get to you by the weekend, so still plenty of time for the sales!!! This last week I got 40 "$2 off" Advil coupons for $2. All of those ended up being free!!! ****Warning**** Doing this is kind of addictive & you may end up going poor $2 at a time!!! A $2.00 of $10.00 coupon has been found!!! Click HERE to enjoy your CVS savings! Print & hang onto this coupon; it doesn't expire until 09.28.08! 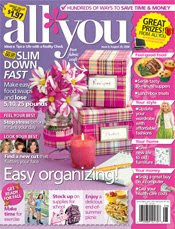 This list (in alphabetical order, instead of by page #) is also on page 184 in the back of your *All You* Magazine! **Don't forget to buy your August *All You* Magazines! There's a TON of coupons in it this month; I'll try to post the list later tonight! ALSO, if you haven't check it out already, Sister Savings puts together very useful spreadsheets of all of the weekly deals for the different stores. I usually print out the store list and then highlight the items that I want to purchase. Worth checking out! Get ready to go back to Fry's multiple times.... they are having the buy 10 save $5 so here we go!! Be sure to check out Shortcuts.com for some additonal coupons to use on top of your manufacturers coupons!! buy 10 items get $5 off, limit 3 in one transaction. The Huggies Natural Care Travel Wipes (40 count) are 10/$10 at Fry's (not part of $5 off deal) & the coupon from 7/20 SS is $3 off any 2 Huggies Natural Care Wipes, so FREEEE! I just got 30, & got overage as well. Bashas 7/30 - 8/5 ~ Triple Coupons !!! *Limit one coupon per transaction. Coupon expires 4 weeks from issuance. NOTE: Page 4 of the ad states “Look for coupons in this week’s circular, mail or at the customer service desk.” Keep your eyes open for extra coupons!! • 4 lb Red or Green Seedless Grapes – 2.99/ea. • Eating Right Mini Peeled Carrots - .99/ea. • Large Raw Shrimp, 31 to 40ct, sold in 2lb bag – 3.99/lb. • Lucerne Milk – 1.99/ea. Hormel Marinated Pork Tenders, 1.5-1.7 lb. – 4.69/ea. Nabisco Oreo Cookies, 10.5-18oz – 1.99/ea. Quaker Chewy Granola Bars or Kelloggs Pop Tarts - .99/ea. • Blueberries, 2lb – 5.99/ea. • Broccoli Crowns – .99/lb. • Cantaloupe Melons, Organic – 2.99/ea. • Clementines, 5 lb box – 7.99/ea. • Green Beans, French, Organic – 2.99/lb. • Peaches, Yellow or White - .88/lb. • Pineapples, Gold – 1.88/ea. • Ready Pac Cut Fruit, 32oz – 6.99/ea. • Strawberries, Organic, 2 lb – 4.99/ea. • 93% Lean Ground Beef – 1.99/lb. • Beef Bottom Round Roast, Boneless – 3.99/lb. • Beef Brisket , Boneless – 4.49/lb. • Beef Chuck Steak, Boneless – 3.49/lb. • Beef Loin Tri Tip Roast, Boneless – 5.99/lb. • Beef Ribeye Steak, Bone In – 7.99/lb. • Chicken Breast, Boneless and Skinless, Safeway – 3.49/lb. • Chicken, Whole and Cut Up, Sanderson Farms – 1.69/lb. • Lamb Shoulder Blade Chops, Bone In – 3.99/lb. • New York Strip Steak, Rancher’s Reserve – 4.99/lb. • Pork Loin Chops, Assorted, Bone In - .99/lb. • Pork Loin Chops, Bone In – 2.49/lb. • Pork Shoulder Country Style Ribs, Bone In – 2.49/lb. • Pork Tenderloin, Boneless – 4.99/lb. Best Food Mayonnaise – 3.49/ea. Bertolli Dinner for 2 – 6.99/ea. Dove Skin Care, 6ct Bar Soap or 19.4-24oz Body Wash – 5.99/ea. Always or Tampax, 14 to 24ct Pads or 20ct Tampons – 3.29/ea. Dawn or Ivory Dish Detergent, 22 to 30oz – 2.79/ea.